Want to light up your home at night without burdening the monthly power bill? 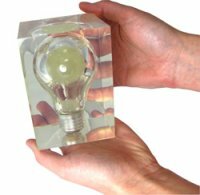 That’s where the Glow Brick comes in – this solar-powered lightbulb is housed within a glass brick, offering more than enough ambient light for you to find your way around long after the sun has set without burdening the earth with toxic batteries. It will soak up the day’s sunlight and store that energy for use by glowing in an ethereal green at night, making this the perfect night light be it for kids or adults. The Glow Brick can be yours for £19.95.